How elegant! Would Bella mind sharing her recipe with us? They look so delicious, please share the recipe! Bella has an amazing talent for baking ~ how wonderful that your family gets to enjoy all the delicious treats she makes! They are so beautiful. Does Bella ship? Bella is a super talented kid. She's blessed to have a mom like you. Tell Bella she really outdid herself with these cookies. They look so soft and delicious! The berries are perfectly sliced. Mouth-watering! I would like a Bella who will make pretty pink cookies and sing beautifully--the household would be much improved by her addition! Bella is going to be a great and famous baker..beautiful and yet simple. Great Job, Bella. These would be so pretty at a bridal shower, wouldn't they? Or tea with friends. Or maybe curled up with a good book! I wonder if my cookies would look better if I had an "A" at the end of my name. Can we expect you to share this recipe since several of us are asking for it? Please share the recipe. I am planning on giving a tea for Moms and think those cookies would look beautiful on a dessert plate. Thank you Bella! 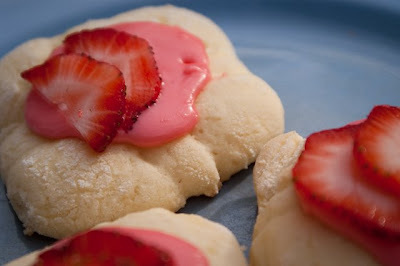 Those look delicious - the strawberry slices are a great idea. With so many sweets always around, it's a good thing you folks are runners! Yes, please do share your recipe. They look so delicious, bet you enjoyed them once they cooled down! Those cookies are beautiful. Your whole blog is beautiful. A friend pointed me in your direction, and I'm so glad she did! Lovely photo! My mouth absolutely waters!